Cottone Auctions held a 30 Year Anniversary Fine Art & Antique Auction on Mar 19, 2016. 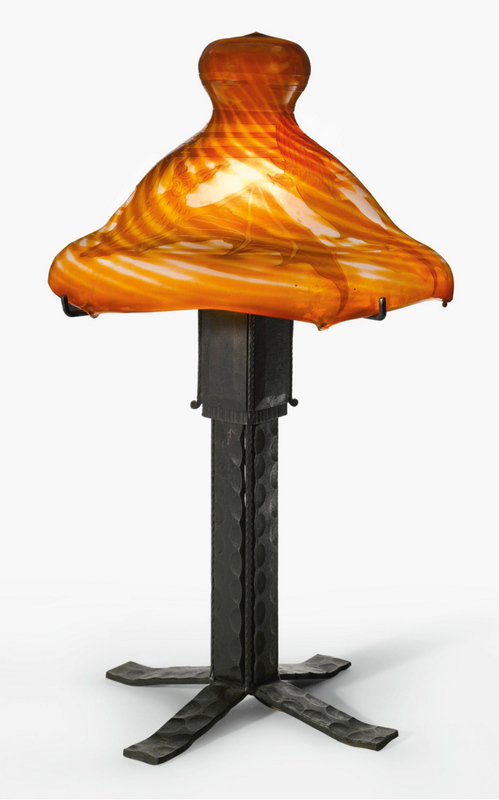 Included in the sale were four Tiffany Studios leaded lamps. Top lot of the group was #265, a rare 22″ diameter geometric and ball lamp. It sold within its estimated range of $50,000 – $75,000, realizing $72,450, including buyer’s premium. The second best result was a 20″ diameter Daffodil table lamp. It sold toward the lower end of its estimated range of $30,000 – $50,000, realizing $35,650, including buyer’s premium. Lot #271 was a 16″ Acorn table lamp with a few condition problems, described as “Shade slightly out of round and several cracked panels. Base has original patina, some wear, small dent.” It also sold at the low end of its estimate of $7,000 – $10,000, realizing $8,625, including buyer’s premium. Lot #267 was a 24″ diameter Curtain Border floor lamp. It failed to sell with an estimate of $50,000 – $75,000. Our next show is only two weeks away. 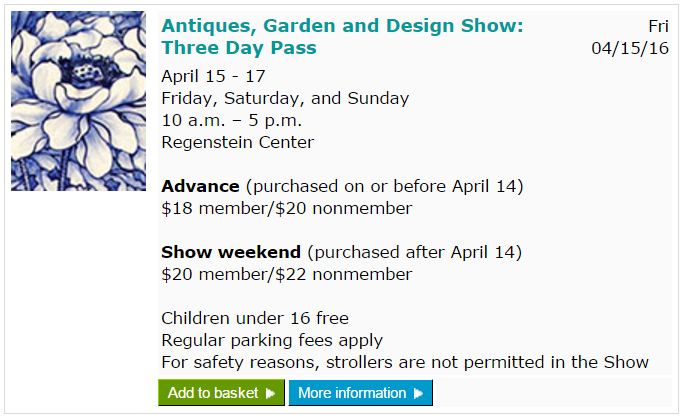 We’ll be in Glencoe, IL, for the Garden, Antique & Design Show, at the Chicago Botanic Garden, starting April 15th. It’s a beautiful show, with both antiques and gardening, that you’ll absolutely enjoy. We only have two remaining shows in the greater Chicago area, so come and say hi! If you’re selling, please let me know. If you have what I’m looking for, I’m paying the highest prices. My decisions are quick and my payments just as quick. Just snap a photo and email it to me. Brunk Auctions, Asheville, NC, held a diverse auction on March 18-19, 2016. 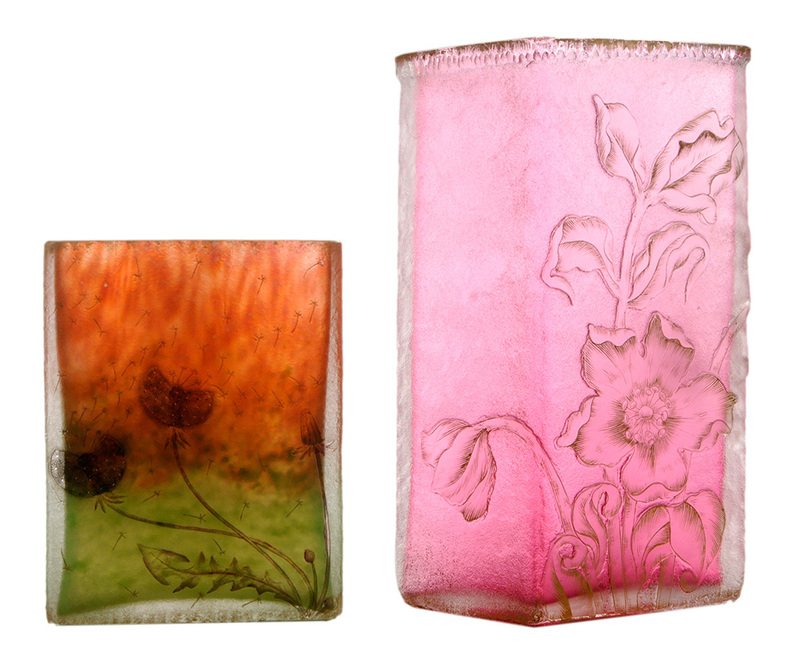 Included in the sale were eight lots of French cameo glass. 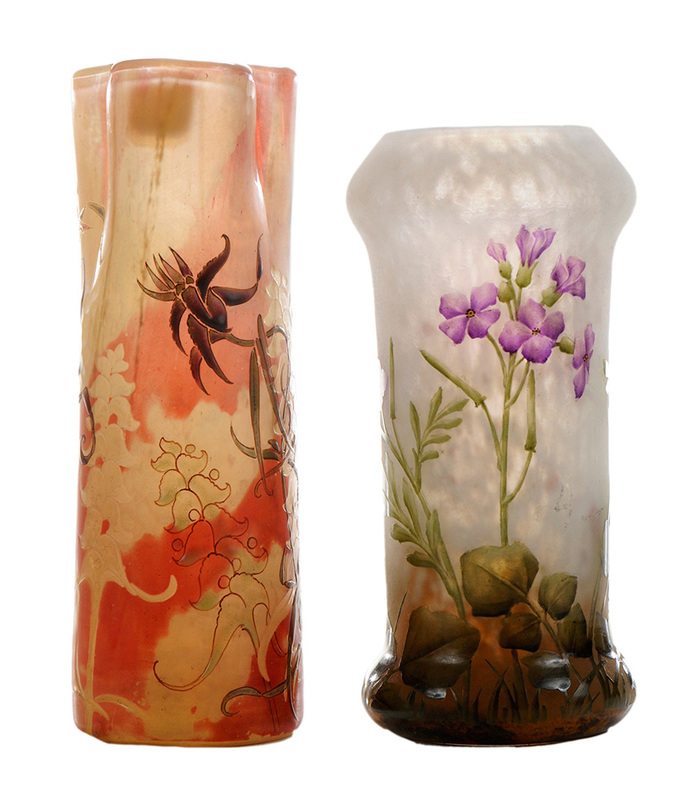 Lot #139 included two small, but very nice, 4″ Daum Nancy vases. They soared past their pre-sale estimate of $1,000 – $2,000, realizing $8,850, including buyer’s premium. Two Daum vases were sold together as lot #144. The vase on the left was very nice, with dandelions, gilding, and a verse in French (called Verrerie Parlante or Talking Glass). They sold above their high estimate of $1,200, realizing $2,360, including buyer’s premium. Brunk combined an early Gallé vase and a Daum vase together for lot #145. The very low estimate of $1,200 – $1,800 was easily exceeded with a final price of $7,080, including buyer’s premium. For the complete results of the sale, click here and Search by Date for the March 18-19, 2016 sale and click submit. Our next show is approaching quickly. We’ll be in Glencoe, IL, for the Garden, Antique & Design Show, at the Chicago Botanic Garden, starting April 15th. It’s a beautiful show, with both antiques and gardening, that you’ll absolutely enjoy. We only have two remaining shows in the greater Chicago area, so come and say hi! Think your unsigned vase is Tiffany Favrile? Think twice. It might be Trevaise. 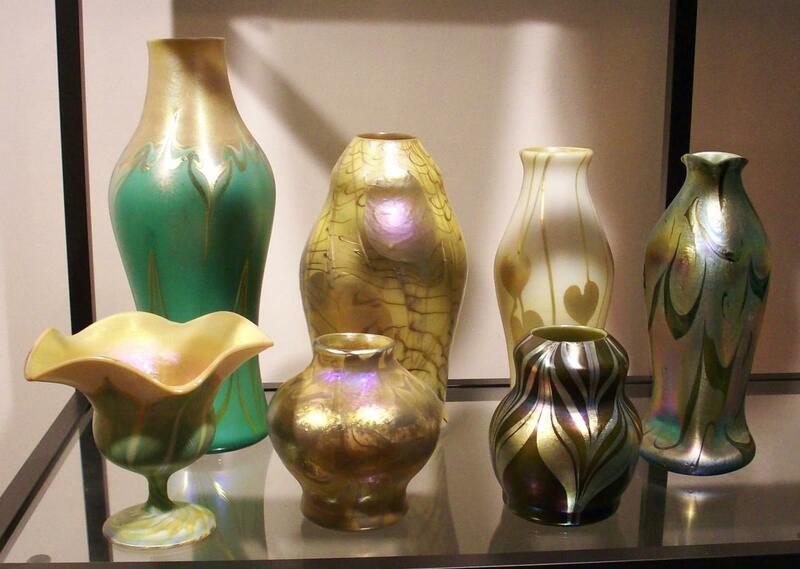 Vases exist that look an awful lot like Tiffany Favrile glass, with good reason. Here’s the story. The Alton Mfg. Co. of New York bought the old Sandwich Glassworks, which had closed in 1888. They hired a talented gaffer, James H. Grady, who had worked at Tiffany Studios in Corona, NY, to come to Sandwich, MA, to head a team to produce “High Class Glassware”, to be called Trevaise. 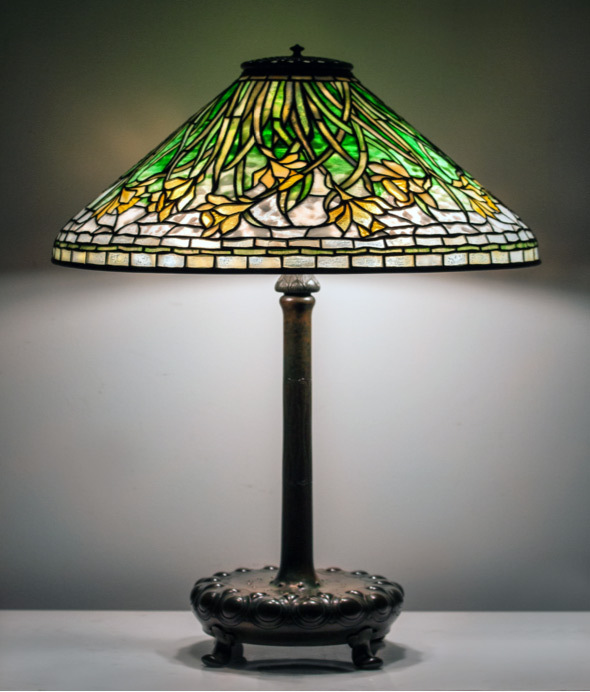 Production began sometime in May 1907, but stopped by the end of the year when the glassworks was closed for extensive repairs. Work was supposed to resume after the holidays, but never did. In February, 1908, C.F. King, the president of Alton Mfg. Co. disappeared with the proceeds of the company. He was later arrested and convicted of 27 counts of larceny. The Alton Mfg. Co. permanently closed. Therefore Trevaise glass was only made for a few months, from mid-May, 1907, to the end of the year. Here are some characteristics of Trevaise glass. Mostly vases were produced without handles. The vases always have button pontils and they are never signed. Of course, there have been unscrupulous people over the years who’ve decided it was easier to sell these vases with Tiffany signatures, so some of them are found today with spurious signatures. 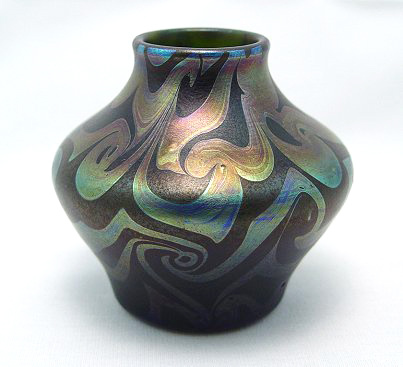 The glass is usually thicker than authentic Tiffany Favrile vases, so they’re often heavier than similar examples from Tiffany. Many thanks to Frank W. Ford for his assistance in the preparation of this post. Bonham’s Los Angeles held a diverse sale, The Elegant Home, on March 7, 2016, with some interesting results. Following are a few. 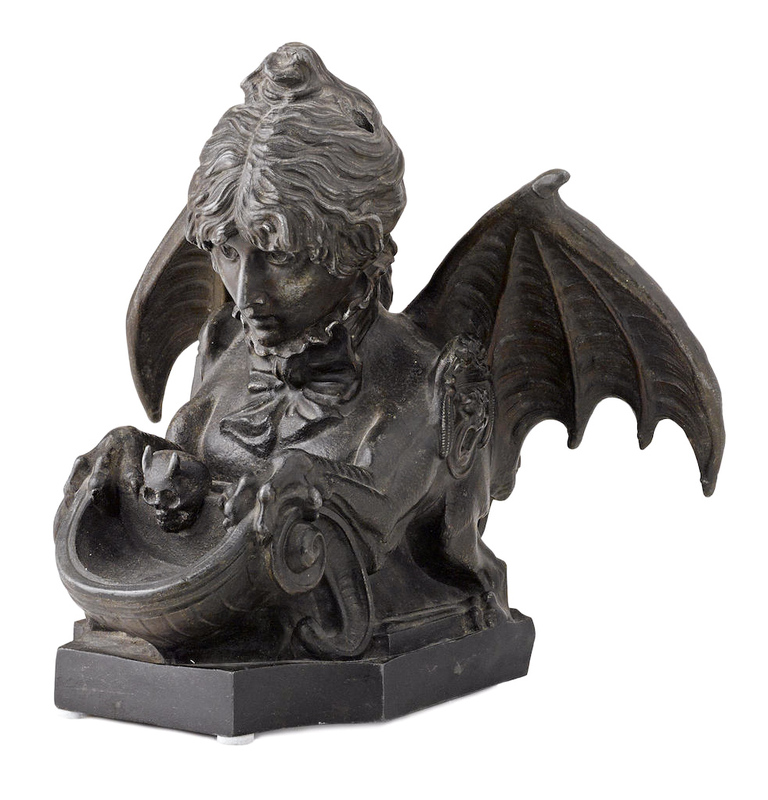 Lot #249 was an amusing early 20th century French, Art Nouveau, spelter, figural inkwell of Sarah Bernhardt with devil’s wings. Helped by her wings, she flew to a final price of $20,000, the highest price of the sale, against a pre-sale estimate of $2,000 – $4,000. I could understand this result if it were bronze, but white metal? I’m sure it was a nice surprise for the consignor. 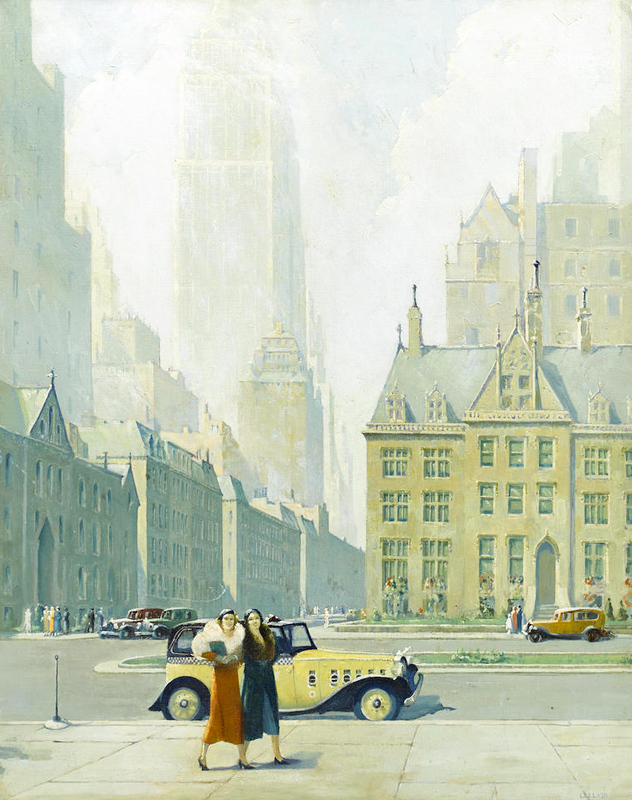 I liked lot #201, an oil on canvas illustration of New York in the ’30s, by Lee Lash. Although it wasn’t Norman Rockwell quality, it had a nice look. The public agreed, pushing the price past its high estimate of $6,000, to realize $8,125, including buyer’s premium. 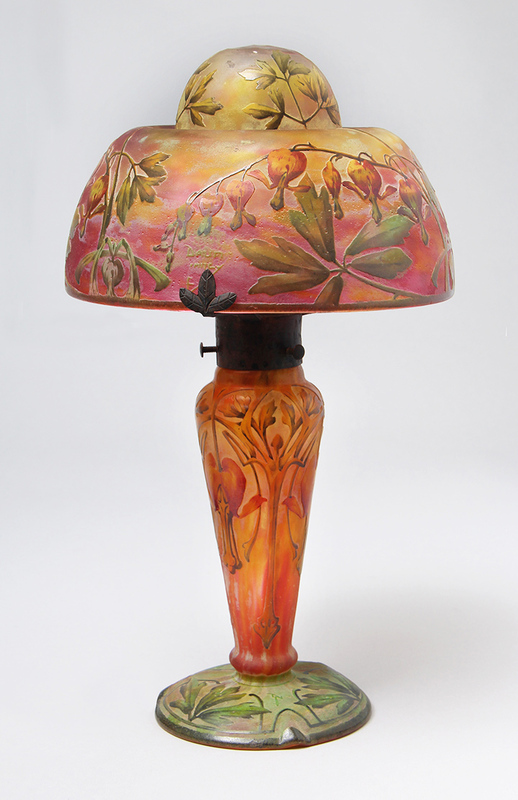 Several reverse-painted and puffy lamps were sold from the collection of Jane Fonda. 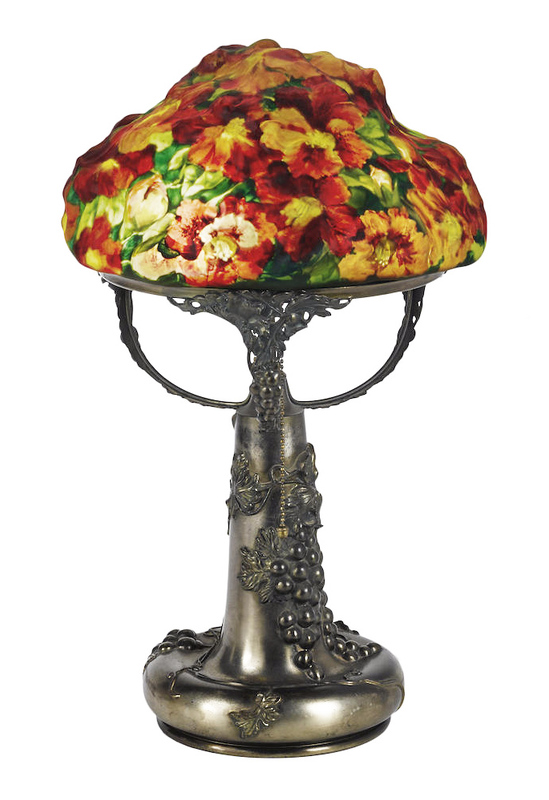 The top lot of this group was a very pretty Pairpoint Azalea puffy table lamp, lot #50. It easily exceeded its high estimate of $6,000, realizing $10,250, including buyer’s premium. From time to time I like to post an update on what’s new at Philip Chasen Antiques. First I’ve hired my daughter, Lauren, to develop my online presence. We now have a Facebook page (please like it), an Instagram page (please follow us), and a presence on eBay. We’re working on starting a 1st Dibs account and other platforms. Hopefully that will lead to additional online sales, as more shows seem to be failing. Now we only exhibit at a handful of shows, when we used to exhibit at over 20 per year. The new merchandise is mostly fine French cameo glass, especially Daum Nancy, but also includes reverse-painted lamps by Handel and Pairpoint and KPM plaques. First up is the killer of all killers, a stupendous 13½” tall Daum Nancy acid-etched and enameled Bleeding Hearts boudoir table lamp. In over 40 years, I haven’t seen or owned a Daum Nancy lamp with this subject matter. The gorgeous color and detail make it one of the most special items I’ve had for sale in quite some time. Common Daum lamps are acid-etched only and are usually plain Jane. Recently I’ve had the good fortune of being able to purchase several fine Daum Nancy scenic vases. 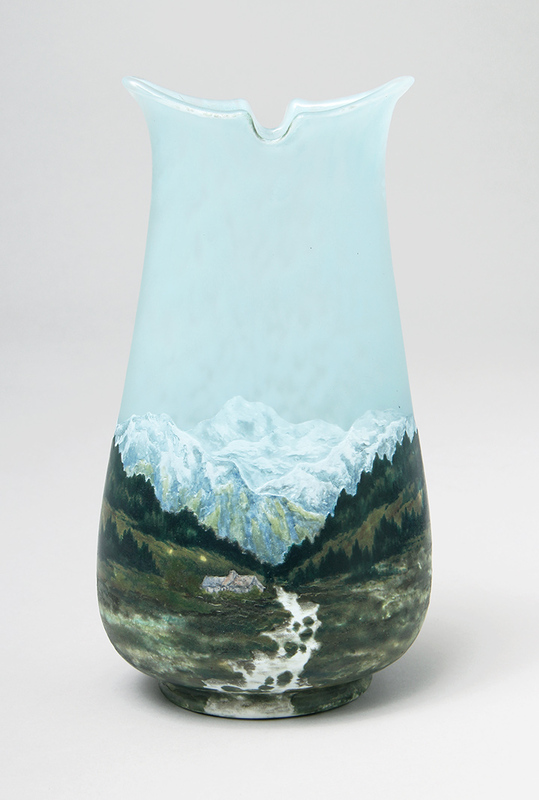 The finest of the group is a truly outstanding 9½” tall vase depicting a village and river in the French Alps. I don’t like to be repetitive, but in this case I must. It’s killer! 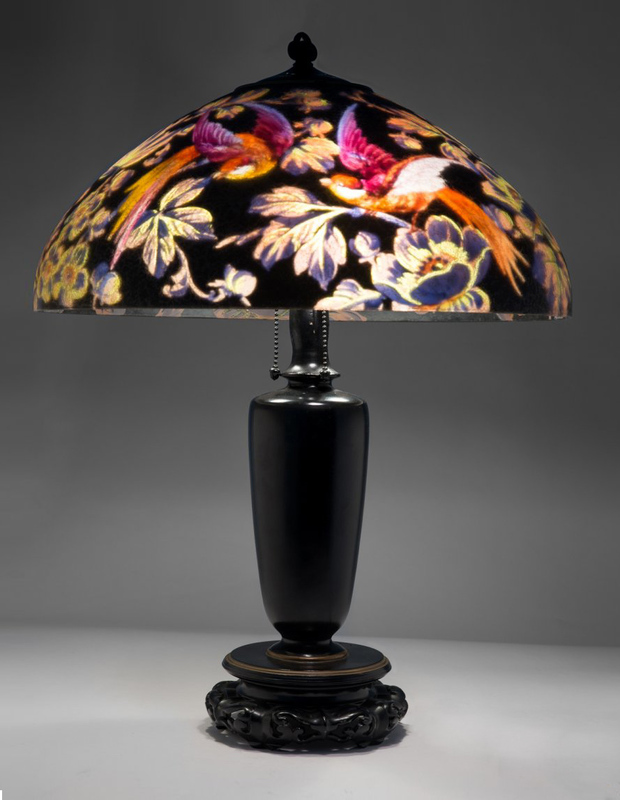 A beautiful and rare 18″ diameter Handel table lamps with exotic birds on a black background is one of the new lamps just in. It’s special and priced right. I listed several new items last week and I’ll be listing many more this coming week, so please check my site often. Our next show is approaching quickly. We’ll be in Glencoe, IL, for the Garden, Antique & Design Show, at the Chicago Botanic Garden, starting April 15th. It’s a beautiful show with both antiques and gardening, that you’ll absolutely enjoy. We only have two remaining shows in the greater Chicago area, so come and say hi! How’s this for a story? A collector in England buys an item on eBay for a few thousand pounds, then consigns it to Bonham’s auction, where it sells for £184,900 ($263,033)? Knowledge is king (pun intended). For the rest of the story click on the following links. 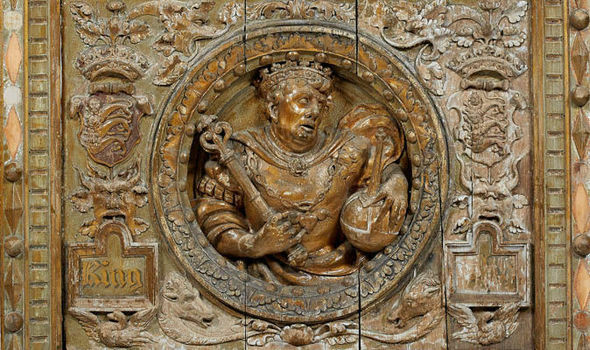 Oak panel from King Henry VIII era sells for £185k and SURVIVING TUDOR TURMOIL: HISTORIC HENRY VIII PANEL LEADS BONHAMS’ FIRST OAK INTERIOR SALE AT NEW BOND STREET. For the actual result from Bonham’s auction, click here. Our next show is not until April 15th, when we’ll be at the Chicago Botanic Garden, in Glencoe, IL, for the Garden, Antique & Design Show. It’s a beautiful show with both antiques and gardening, that you’ll absolutely enjoy. We only have two remaining shows in the greater Chicago area, so come and say hi! If you’ve ever wanted to go back in time, this story will bring you as close as you can get. 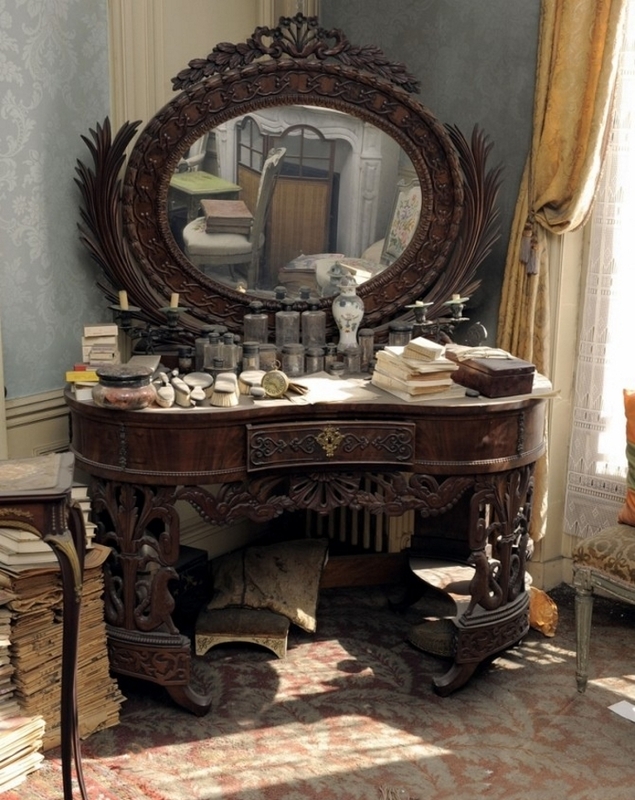 A turn-of-the-century Paris apartment was opened for the first time in 2010, after the death of its owner. The apartment was completely untouched after being abandoned sometime between 1939 and 1942 (details are conflicting), to escape the invading Nazis. The owner, Madame de Florian, had paid rent on the apartment until her death in 2010. It was a time capsule of life during the Belle Epoque. 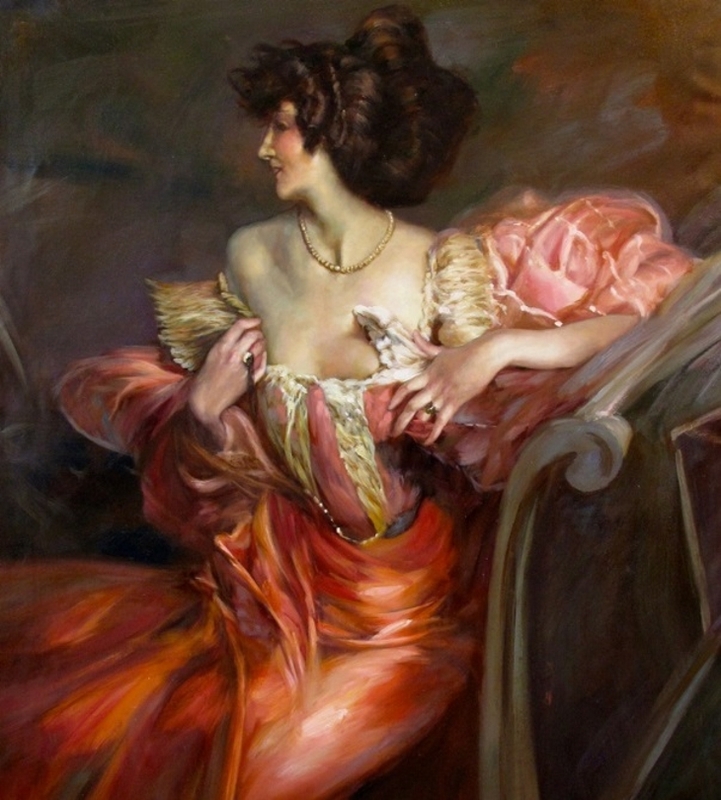 The most fabulous object discovered in the apartment was a painting of Madame de Florian’s mother, Marthe, painted by Giovanni Boldini, her lover. The painting was sold at auction for $3.4 million, helped by its provenance and juicy history. 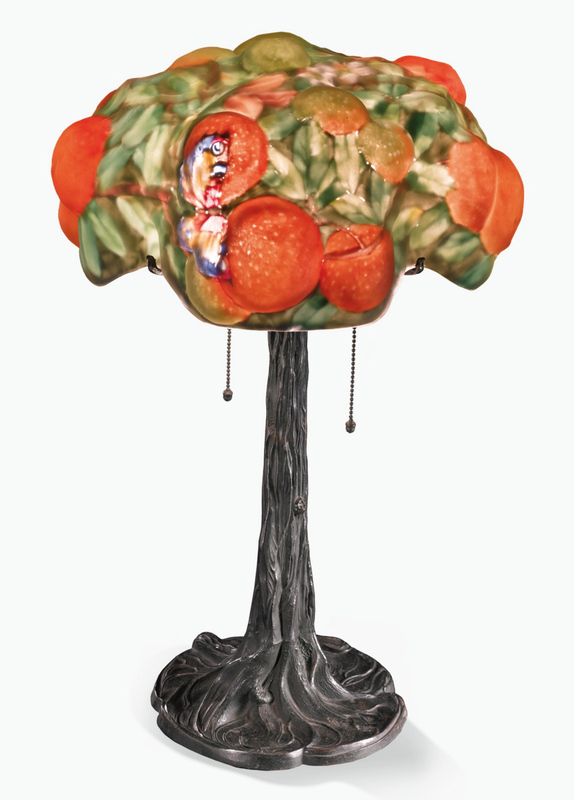 Sotheby’s New York held their Design sale yesterday, March 2, 2016, with total sales of $3,495,188. Anything French — glass, bronze, wood, was hot. 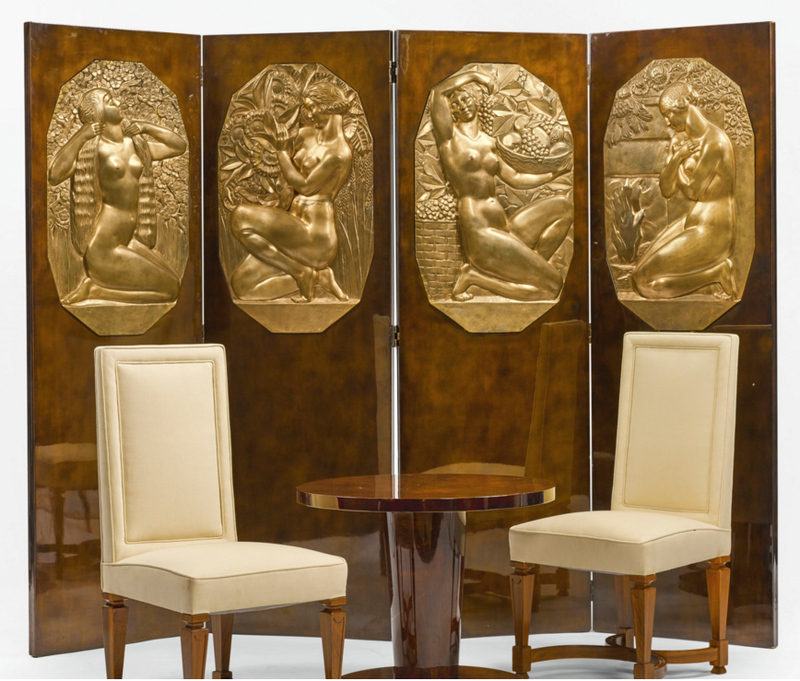 An Art Deco screen, with inlaid bronze panels, lot #140, estimated to sell for $5,000 – $7,000, had multiple bidders until the dust finally settled at an amazing $187,500, including buyer’s premium. Don’t get me wrong. My wife and I admired it, so it’s conceivable we would have tried to buy it within the estimated range, but $187,500?? 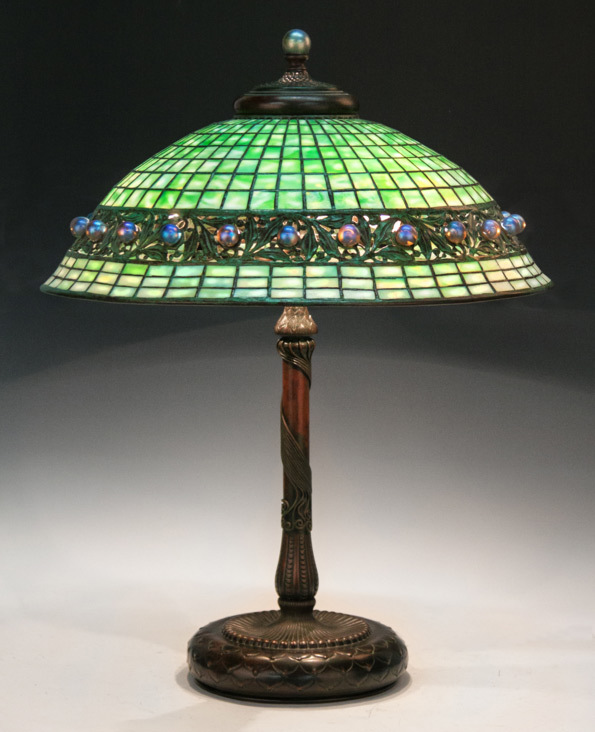 French glass did very well, with lot #59 performing second best (to a Daum lamp with an applied dragonfly, lot #83). 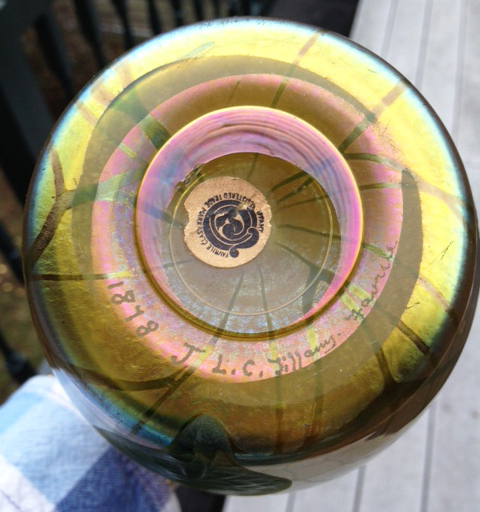 This bat flew away for $31,250, against a pre-sale estimate of $6,000 – $8,000. The Gallé shade with bats was rare and bats are very desirable subject matter, but the problem was the fair workmanship and the boring color. Then consider the shade was made around 1900 and the Art Deco base around 1925, so they weren’t born together. I assume the bidders had a lot of money and not much knowledge – in other words, more cents than sense. 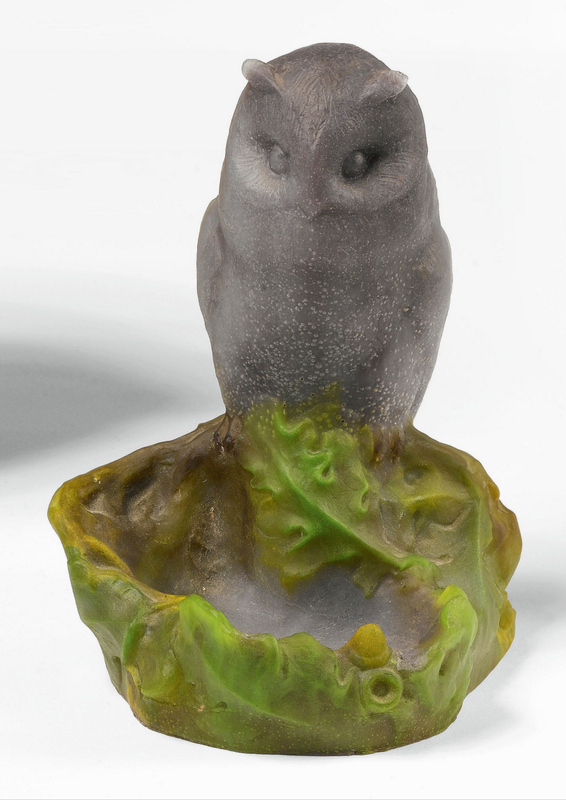 Pâte-de-verre sold very well, with a rare Daum Owl vide poche, lot #86, selling for almost four times its high estimate of $6,000. It reached $27,500, including buyer’s premium. 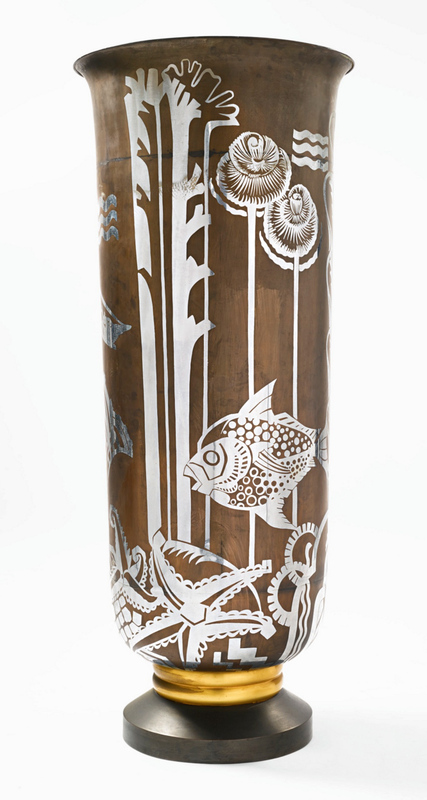 A beautiful French Art Deco floor vase, 55¾” tall, by Fernand Grange, was another standout. It soared to $112,500, against a pre-sale estimate of $10,000 – $15,000. You wouldn’t know the Pairpoint puffy lamp market has been soft for a while from the result of lot #45, a rare Orange Tree. It zoomed past its pre-sale estimate of $12,000 – $18,000, to realize $47,500, including buyer’s premium. Even a healthy chip on the inside lower rim and many light leaks (from missed spots in the original paint) didn’t stop the determined bidders.